"In our world too, a Stable once had something inside it that was bigger than our whole world." Music! Merriment! Laughter! Christmas is a time of rejoicing. Music and wonderful books help to make the season of Christ's Birth come alive. Here are some suggestions for activities, good reading and music for the holiday season. We use great Christmas books as "art" and music as "music" studies for the month. And use them to create "atmosphere," for if we are truly educated by our intimacies, this season gives us the opportunity to become intimate with the Holy Family, and the Joyful Mysteries. Please scroll down for Advent ideas, and music. Gifts for a Narnian Christmas! Candle making is a terrific activity for the whole family. We like to dip candles rather than pour them into a mold. Dipped candles are fun and easy. Young children will need supervision. Put on some music (Please scroll down for suggestions)! Make the pink candle first (make several for gifts!). Break pieces off the block or sheet of wax, and place them into the coffee can. This can be hard work, depending on the shape of the block. A hammer may be used, or a heated metal spatula (CAUTION!!) may help to slice the wax into smaller chunks. Smaller chunks melt faster, but the size is only important for fitting the wax into the can. The more wax you put in the can, the deeper the melted wax will be, and the longer your candles will be. Don't fill it too high at first--you can always add more wax as it is heating. Place the can with the wax into the pot. The water should come up about halfway to the top of the outside of the coffee can. Water and wax should not meet! Now you have a double-boiler for wax. Heat the water to a boil, watching occasionally for melting wax. This may take quite a while. While the wax is melting, cut the wicks to a length slightly longer than the depth of the coffee can. This will give you a good sized candle, and leave room to tie the wick onto the stick. Tie wicks on with a long end dangling. When the wax has melted, add the pink color chips and scent if desired. The more chips you add, the darker the color will become. Remove the coffee can and place on a burn proof surface. I like to cover a table with several layers of newspaper, and place the hot can of wax on a hot-plate or piece of slate in the middle of the table, but toward the edge. Caution! This is hot stuff! Use oven mitts, and be careful not to spill the wax. Each child may take a turn dipping the wicks (soon to be candles) into the wax while holding the stick (not the wick) to avoid touching the wax or the coffee can. Dip the wicks (candles) in and take them right out or you will begin to shrink your candles rather than to grow them, as the hot wax will melt cool wax off your candle! Have the children touch the bottom of the wick (candle) to the edge of the can to minimize dripping. The candles must cool between dips; each dip adds another layer of wax to the growing candle. You may carefully straighten the candles for the children as the wax cools between dips. This is a good time to talk about candles, history, and light (see book list). Have the children count how many dips it takes to make a candle. When the candles are fat enough, hang them to dry. Repeat for the purple candles, using purple coloring. Make some extras to give to friends and relatives. Cooled wax can be stored in the cans for next year (mice will eat wax, though, so store carefully!). A chandler's tongue twister: The fatter it gets, the faster it gets fatter. Candle Science: During the Advent season, we usually keep our lessons light (no pun intended)--plenty of good reading, but most other academics are set aside as we prepare for Christmas. The older kids have enjoyed designing their own study using The Chemical History of a Candle by Michel Faraday. This is a series of "Christmas Lectures" for young people given to young people by the physicist. The book, a transcript of these lectures, is elegant in language, but readable, and very scientific. The new version includes simple demonstrations for the kids to try--the same demonstrations Faraday used! What better way to accompany the season than with the science behind the ubiquitous candle? Please scroll down for more Advent ideas, and music. --Ancient Noels Galician, Basque, German/Dutch and English, on traditional instruments! --A Cello Christmas (seriously, this is a sublime CD. It is truly one of my favorites. The sound of a church full of cellos is ethereal). Andrea Bocelli's Sacred Arias Included are the Shubert and Gounod "Ave Maria"'s, Mozart's "Ave Verum," and more. Vienna Boys' Choir Christmas Favorites very traditional, from the famous boy's choir. Bach: Arias and Choruses from the Christmas Oratorio like the title says--beautiful joyful music. One cannot have enough Bach! Christmas Chants / Santo Domingo de Silos Benedictine Monks--meditative favorite! Here's a quick and easy way to make an advent calendar using last year's Christmas cards (you couldn't throw them away either, could you?). I don't remember where I got the idea, but if you know the source, please e-mail me and I'll mention it. Go to the Gospel of Luke and divide the Christmas verses into 24 sections (chapter 2, vs. 1-24 work nicely <G>). Write each verse on a small piece of paper (or photocopy and cut), numbering each, and glue randomly onto a large poster-board. 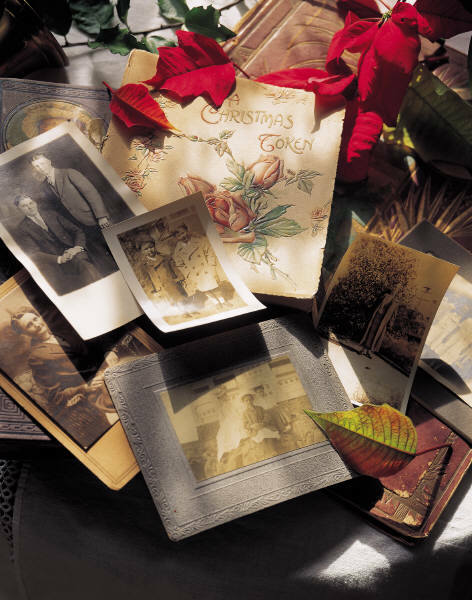 Take last year's Christmas cards and cut the covers off. Tape or glue the left side of the covers so that they fit carefully over the verses, like doors. Make sure to number the covers as you did the verses. Poke a hole through the right side of the cover, and through the poster board right under it, so that a ribbon may be placed through both and the door may be tied shut. Open the numbers in order, read, and enjoy the Advent season!